Please prepare a monologue - if you do not have a monologue a cold reading will be provided for you. 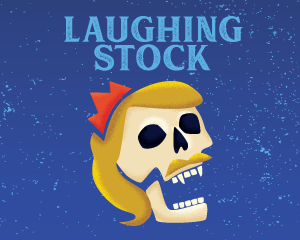 LAUGHING STOCK is a hilarious backstage farce and genuinely affectionate look into the world of the theatre. When The Playhouse, a rustic New England summer theatre, schedules a repertory season of Dracula, Hamlet and Charley's Aunt, comic mayhem ensues. We follow the well-intentioned but over-matched company from outrageous auditions to ego-driven rehearsals through opening nights gone disastrously awry to the elation of a great play well told and the comic and nostalgic season close. Rehearsals: Rehearsals will start Saturday, September 7th and will be on Saturday’s and Sunday’s in September and adding 2-3 weeknights 7:00- 9:30 in October until Opening Night on October 18th. Performances are October 18th – November 10th. Bursting with acting enthusiasm and is like, very, like, expressive, like…you know? Don’t mess with his/her office supplies!